Man is not the only snarling beast to take the field during times of war. 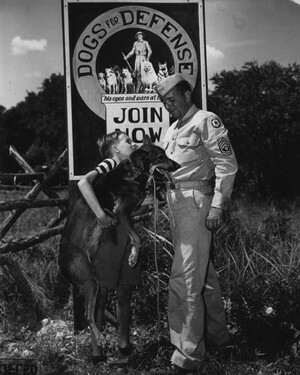 In 1942 the American Kennel Association with the help of another group named Dogs for Defense began a campaign to have the American people volunteer their canine companions for active duty. Dogs have been a part of nearly every military in history, but prior to this movement the U.S. forces had not developed this resource on such a large scale (though they did have some dogs already in service). The U.S. would train 10,000 dogs for duty during WWII, which paled in comparison to the 200,000 dogs Germany is thought to have trained by the time America entered World War II. The American volunteer response was so swift that by March of that same year the Quartermaster Corps began inducting dogs as service animals. Their training was completed at numerous special camps across the U.S. There was some initial difficulty in structuring how and where these dogs received their training, but they were eventually schooled for duty as Sentry, Scout/Reconnaissance, Sled/Pack, Messenger, or Mine Detection dogs. This article was created by DanielHunter279 on Imgur and is reposted here with his permission. 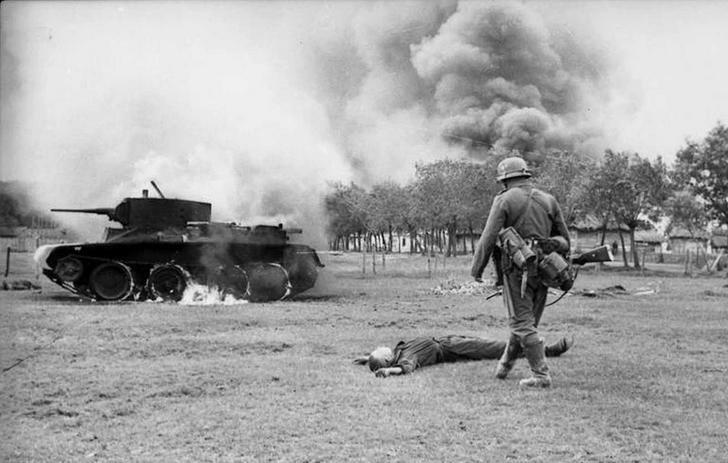 A German infantryman walks toward the body of a killed Soviet soldier and a burning BT-7 light tank in the southern Soviet Union in in 1941, during the early days of Operation Barbarossa. Operation Barbarossa (Unternehmen Barbarossa) was the German codename for Nazi Germany’s invasion of the Soviet Union during World War II, which commenced on June 22, 1941. It was to be the turning point for the fortunes of Adolf Hitler’s Third Reich, in that the failure of Operation Barbarossa arguably resulted in the eventual overall defeat of Nazi Germany. The Eastern Front, which was opened by Operation Barbarossa, would become the biggest theater of war in World War II, with some of the largest and most brutal battles, terrible loss of life, and miserable conditions for Russians and Germans alike. A selection of the most obscure bits of knowledge – because you can never know too much about tanks. During World War I, the British “Landships Committee” changed their title to keep their new vehicles secret and not so obvious. They went with “water carriers” and “tanks.” That’s also why tanks have so many “nautical” component names, such as bow, hatch, hull, and sponson. Much like today’s electronics or Swedish furniture, every Tiger and Panther came with an owner’s manual peppered with cartoony illustrations. Do you hear the wind rocking piles in the frozen wastelands of industrial areas? 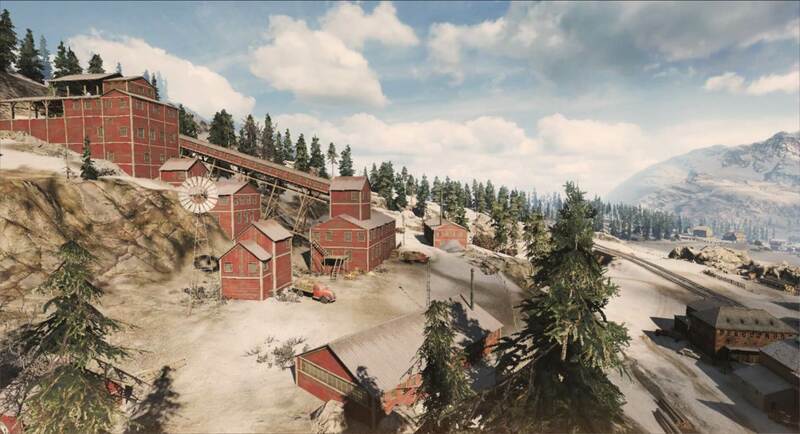 This is the place where desperate adventurers and decent fathers of the family lost illusions, experienced tragedies or became fantastically rich and met happiness in the mines. You are waiting for six points on the map “Klondike” and five short stories about conquering Alaska. You have probably heard about the American experimental heavy tank T34 somewhere, maybe from World of Tanks, War Thunder or Wikipedia. It’s described as having an excellent penetration at about 247 mm from 100 m, which is a feat compared to the German 8.8 cm KwK 43 gun armed on the Tiger II. But did you know that it could do more than that? The T34 was a WWII prototype heavy tank developed in 1945 in response to the German armored threats such as the Tiger II and Jagdtiger. The T29 was considered satisfactory enough in term of performance with its 105 mm T5E1, but lacked serious firepower in contrast to the 12.8 cm cannon. The T30 was only armed with a 155 mm as a bunker buster, with sub-par anti-tank performance across the board. As such, a project was initiated to rearm the T29/T30 with a modified 120 mm M1 AA gun, the 120 mm T53 L/65. Firing a 23 kg heavy projectile at 960 m/s, the gun was able to closely match the performance of said German gun. Unfortunately for the Americans, World War II was already over by the time the T34 was assembled. Post-War development led to the T34’s engine being upgraded from using the Ford GAC to Continental AV1790. Extensive trials of the T34 as a “technology demonstrator” led to the M103 Heavy Gun Tank. The earliest known record of the requirement to develop the T34 heavy tank was from the first of February, 1945. The Army expressed concern about using the 155 mm gun with heavyweight 100 lb projectiles on the T30 (M112B1), mainly because of the effectiveness of it against enemy tank armor, with the rate of fire calculated in. It was expected to be very ineffective (the M112B1 only penetrates 170 mm of armor from point blank, while the rate of fire from the gun is only 3 RPM). Seeing the potential problem that would likely cause an unnecessary issue in the future, the Ordnance Department went to study for possible application of the 120 mm M1 anti-aircraft gun for the heavy tank. Thanks to DeadArashi for sending this to us.